Candela E-Connect is a SaaS based solution to facilitate integration of Candela with E-Commerce Platforms for conducting Online Sales. Candela E-Connect acts as a gateway between Candela RMS and E-Commerce platforms. This solution stores the necessary data like products, prices, inventory and provides different APIs which can be used by any third party (providing Online Store solution) to fetch this information. 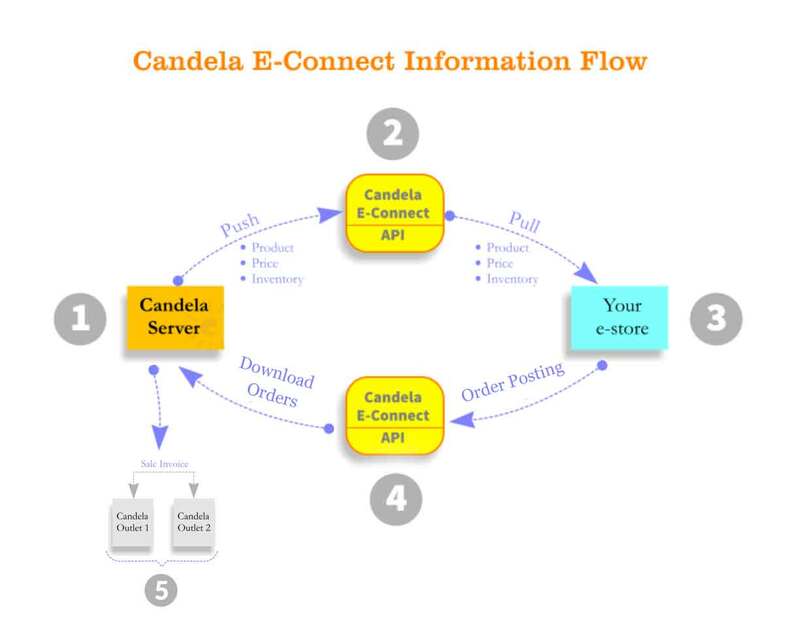 The information flow takes place between Candela Server, Candela E-Connect, E-Commerce Platform, and Candela Outlets. The data related to products, prices, and available inventory is pushed by Candela Server to E-Connect . This is done at regular intervals. E-Commerce Stores fetch data through E-Connect APIs and uses that for generating Online Sales. The Sales invoices generated on the E-Store are then pushed into selected Candela outlets using API of Candela. Candela E-Connect has its own database to store information. The E-Commerce stores can pull this data even when Candela Server is offline and not available. Candela products, product attributes, prices, and specific discount data is available in E-Connect database. The data synchronization between Candela Server and E-Connect takes place at regular intervals and information is updated. The data synchronization is optimized and only incremental data (data related to changes) is pushed to E-connect. Same incremental data is available, through APIs, to the E-Commerce Stores. E-connect is hosted on special Cloud Servers and has high availability.